One of the advantages of option strategies is that you can create a system with a guaranteed downside risk. That is you can create risk-defined trades. In the highly volatile and uncertain markets that we are seeing of late, stop losses and offsetting hedge trades cannot always be relied on to guard against losses. Trades with “inbuilt downside” are one of the main reasons for using options and option strategies. As described in the companion tutorial, iron condors, are risk-defined trades. The downside limit is known from the outset. When you are comfortable with iron condors, strangles will be another appealing strategy. A strangle strategy is an excellent tool in a commodity or currency trader’s portfolio. A strangle is basically an iron condor without two of the protective option strikes. For a short strangle, a trader would sell a call while also selling a put in the same expiration month for a given underlying. For example if you want to sell a strangle in Natural Gas futures, with Natural Gas trading at 2.50, you could sell a 2.80 call and a 2.20 put for a net credit. The width of the sold strikes can be chosen at your discretion. Meaning, you could choose to sell very low delta options or options closer to the price of the underlying with a higher delta. One important caveat to note with short strangles is the inherent risk. Theoretically, the maximum loss is unlimited or undefined to the upside. This is because the underlying commodity or currency could go to infinity, and the maximum loss for the downside risk is capped at the underlying going to zero. An underlying going to infinity or to zero would not be a pretty sight for a short strangle, so it is to be used with caution. Nevertheless, a strangle can also be used in a risk defined manner. Instead of selling an out-of-the-money call and put, a trader could purchase the call and put and create what’s called a “long strangle”. The long strangle is essentially the long iron condor without the corresponding sold put and call. For the long strangle, a trader’s maximum profit would be unlimited. The maximum loss is the amount paid for the strangle. Ideally, a trader will purchase “a strangle” when he expects a dramatic move in the underlying, but is unsure of the direction. Very similar to the strangle, the straddle involves either selling or purchasing the exact same strike price of an option in the same expiration month. For a long straddle in Euro FX futures trading at 1.115, a trader could purchase both the 1.12 call and put, resulting in a risk defined trade with unlimited profit potential. Similarly, for a short strangle the trader could sell both the 1.12 call and put, resulting in an undefined risk trade with limited profit. The undefined risk for the short straddle (as well as the short strangle) is countered with a higher probability of profit. The butterfly is a less known and practised trade by retail investors because of its seeming complexity. However, when you break it down, it’s relatively straightforward. 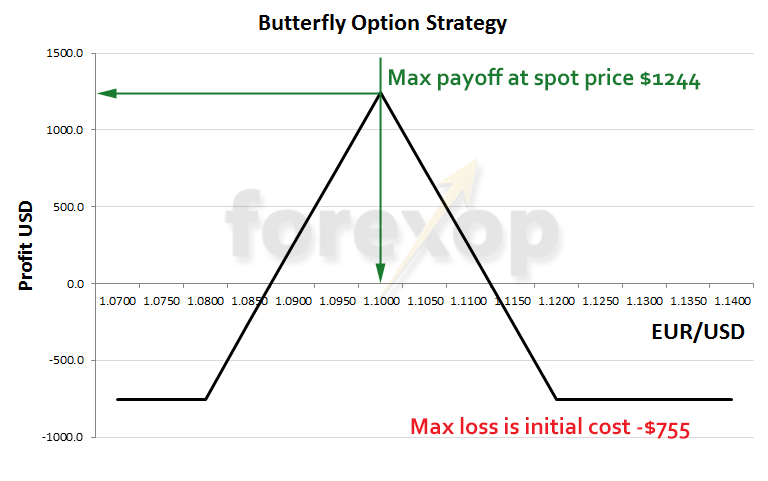 A butterfly spread involves buying a call with a lower strike price. Then selling 2 calls with a greater strike price (usually at or close to the spot price), and then buying one call with an even greater strike price. The basic concept of a butterfly spread is that it follows a ratio of 1-2-1. So a trader could do a butterfly of 50-100-50, and it would still be a butterfly. It’s therefore symmetric, hence the name “butterfly”. The system of trades achieves maximum profit if the underlying remains at the current price, namely 1.10. In this case, the 2 sold calls expire out of the money so the premium is collected and no payout is made. The call at 1.08 expires in the money and the call at 1.12 expires out of the money. To calculate the maximum profit, take the difference between the strikes of the sold calls and the lower long call and add the initial cost. The maximum loss occurs if the price is less than 1.08 or greater than 1.12. Hence this is a strategy to use if you are expecting the underlying to remain flat. The payoff diagram below illustrates outcomes. 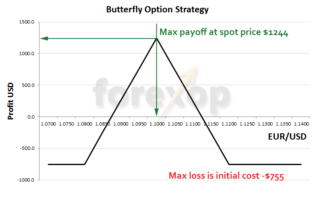 Just like all of the aforementioned options strategies, a butterfly spread can either be long or short for a net debit or credit and, of course, be done for either the call or put side. I am so glad you put me on the margin maximisation trail. I checked twice with my broker IB team and the two products -spot fx and CME currency futures – are treated separately which means no benefit in terms of initial margin . I would end up paying roughly a total of about 19% initial margin. But P&L will be treated for all assets and so there will be some relief for me . Not until I have put up the additional margin for futures trading. However, I was told, as long as I used spot fx to trade any other pair, margin will be treated as one. I looked around a few onsites for real-time data on currency correlation. From myfxbookall’s real-time correlation data (maximum one month available) I found top positive 4 correlational pairs in last month are: GBPSGD, 94.5, GBPCHF 94.2, USDJPY 88.2, EURJPY 85.9%. Now how I am lost. What factors cons and pros should I consider before using this spot route for hedging to minimise margin? range-trading or mean-reversion tendency pair, their direction and reversal or major pullback? Looking forward to benefit from your vast experience. the cross pair very recently and even the customer service guys at the broker’s place are not aware of its existence. data plus use of IB trading platform to test trading strategies. I want to do fx options trading – splitting in two streams. Presently my 2 year experience is in Directionless fx options trading – 15 delta OTM strangles only. I am willing to buy. More than 40 spread strategies are being touted by stock options educators. Which of those will work on fx directional trade? Please write something on what could be good and valid spread strategies for directional trades for fx . is very critical. Return is 100% per annum but I lack funds for buffer margin. Because it needs deep pockets I want to do directional spread trading. Would you please write an article on which directional strategies will really work on currency futures options? Spot fx gives me stress and I want to stick to currency futures options only. I am grateful to you for taking out time to write in detail. 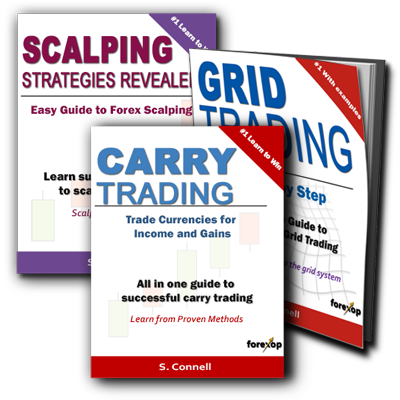 You are providing invaluable simple to understand education on fx options. Thank you. no options on this pair and the OTC options spread is too wide almost 25 pips and so it is not workable. pairs JPYUSD and GBPUSD i still save a lot of spread. The spread on each pair is 2 to 3 pips. sell JPY call to hedge long side of JPY? I am confused . Can you please write something on this on how to hedge such currency pairs futures on CME. I’m glad you find this article helpful. Although there are no easily accessible options for spot GBP/JPY, the CME offers options on both GBP and JPY futures. They are highly liquid with plenty of open interest. If you use these options, however, you would effectively be trading two separate currency pairs, GBP/USD and JPY/USD, because the futures are traded in the US dollar. And as you point out, you will have a little bit of slippage when doing this. Despite this, it seems to be the best option for your situation. On the CME, GBP futures are represented by the symbol “6B” and JPY futures are “6J”. The first option is to continue trading spot GBP/JPY and use GBP and JPY futures options traded on the CME to hedge these positions. Depending on CME portfolio margining, margin requirements might work out in your favor if you maintain a position in the spot currency pair. However, this might depend on your broker and account specifications and since futures and forex are two different instruments, you would have to see what the margining is for yourself in your own account. A simple phone call to your broker’s trading desk will clairify this. The second option you have is to trade your strategy entirely using CME futures. This is possible, but likely not as effective. If you are buying (or selling) GBP futures and selling (or buying) JPY futures you would essentially be gaining the same exposure as trading the spot currency pair of GBP/USD and you would be able to hedge your positions with options. The best method of doing this would be a pairs trade (where you simultaneously buy and sell the futures) , so you could minimize unwanted slippage. I really hope this helps, and please let me know if you have any more questions. Thank you very much for explaining me in details. I had posted comment earlier but those have not appeared.